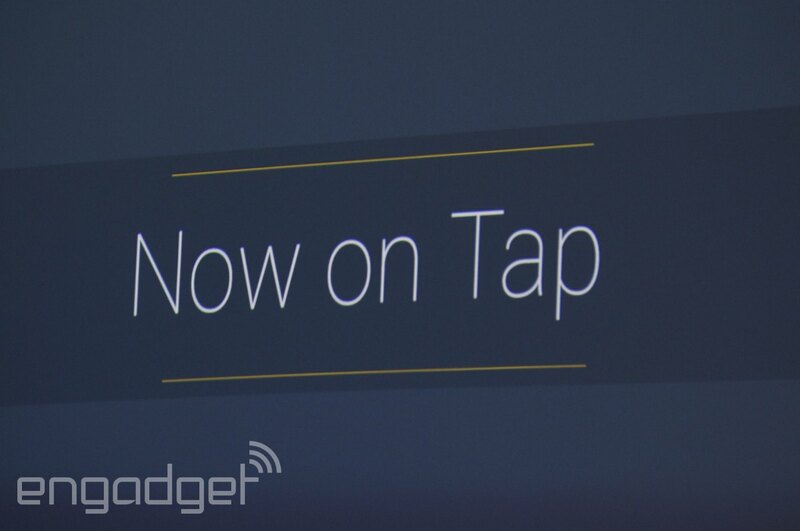 Google's trying to make Now even more subservient to your needs with its next version for Android M called Now on Tap. The new digital assistant listens in on your activities and gives you supplemental info like store hours or movie reviews right inside an app or web page. For instance, if a friend texts you with a dinner invite at a new restaurant, you can ask Now on Tap for reviews, hours and other info mid-conversation. It'll also create reminders on the fly about previous email or text discussions and incorporate detailed Knowledge Graph information. In another example, if a pal sends you an email expressing interest in a new movie (Ex Machina seems appropriate) you can instantly invoke Now by holding the "home" button to get ratings, purchase tickets or see previews. Finally, Google said that developers don't need to do anything special to get Now on Tap to work with their app, as long as it's indexed by Google. The new features should help it keep up with, or even surpass, Apple's Siri and Cortana from Microsoft. Now on Tap is married with Android M, so expect to see it as soon as that OS arrives.